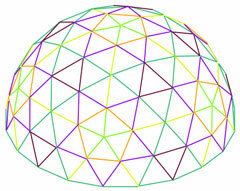 The frequency of a dome refers to the amount of poles that connect the centers of the pentagons. If it is a 3 frequency then there are 3 poles from the centre of 1 pentagon to centre of the next, if it’s a 4 frequency then there are 4 poles from the centre of 1 pentagon to the centre of the next and so on. 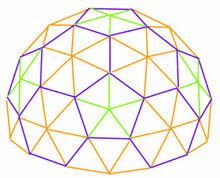 Every dome has 6 pentagons, 1 at the top & 5 around the sides. The higher the frequency, the rounder & stronger the dome. This dome has 65 poles of 2 different lengths & is half of a sphere. It’s uses include tents, greenhouses, climbing frames and garden shelters. It is simple & quick to assemble. 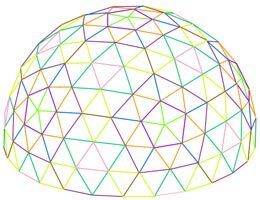 This dome has 165 poles of 3 different lengths & is 5/8 of a sphere. The extra skirt at the bottom gives it greater height. Removing the skirt makes it 3/8 of a sphere which means it has 120 poles. This dome has many more uses because of the height such as aviaries, party, concert or event venues or even accommodation as a second floor can be added. This dome has 250 poles of 6 different lengths & is half of a sphere, making it a much more rounded structure & giving it extra strength. The uses of this dome are as the 3 frequency but the extra strength means it can be much bigger. This dome has 425 poles of 9 different lengths & is 5/8 of a sphere, meaning that it is much more rounded & stronger for larger structures. This impressive dome has 555 poles of 9 different lengths & is half of a sphere, making it the strongest of the dome frames that we make.. The most suited for living spaces of all our domes because of its size and strength, a second floor can easily be added inside giving an upstairs area perhaps for bedrooms. Please get in touch for some no nonsense friendly advice if any of the above is confusing, we would be only too happy to explain the various options.